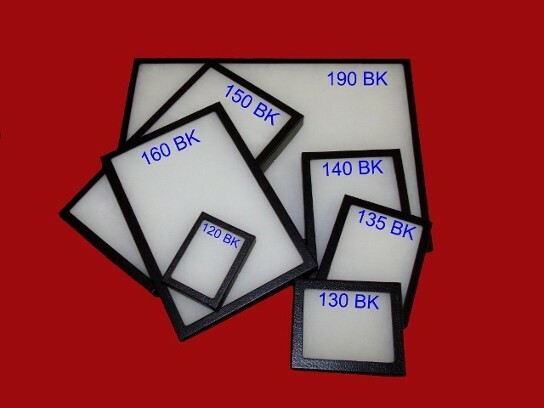 Our Riker-Type Displays come in various sizes, available with inserts to meet any of your displaying needs! 120 BK - 4 1/4" X 3 1/4" X 3/4"
130 BK - 5 1/2" X 4 1/2" X 3/4"
135 BK - 6" X 5" X 3/4"
140 BK - 8" X 6" X 3/4"
150 BK - 12" X 8" X 3/4"
160 BK - 16" 12" x 3/4"
190 BK - 20" x 14" x 3/4"
160 BKI - 16" X 12" X 3/4" with inserts. 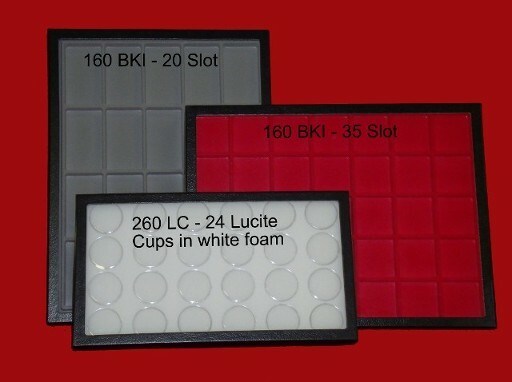 20 slot - measuring 2 1/2" X 5/8"
260 LC - 14 1/2" x 7 3/4" x 1" with lucite cups. Available in black or white foam. 260 BKI - 14 1/2" x 7 3/4" x 1" with insert. Available in red, blue, black or gray. 20 slot - measuring 2 1/" X 5/8"
blue, black or gray. Please specify. 260 BKI - 14 1/2" x 7 3/4" x 1" with insert. Ring tray. FT 10a - 10 slots - each 7 1/4" X 2 1/2" - for watches and bracelets. Available in black, red, blue or gray. Please specify color. 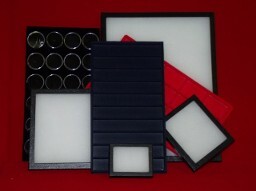 FT 10 - 10 sections - each 3 1/2" X 2 1/2" - Avaiable in black, red, blue or gray. Please specify color. 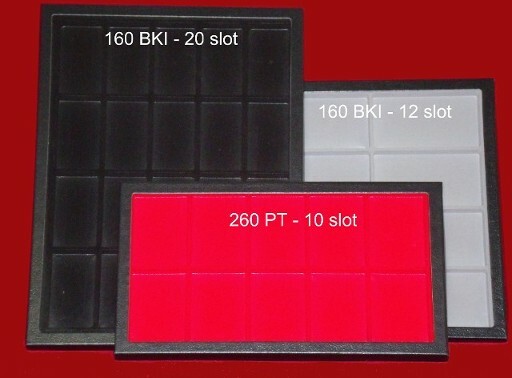 FT 18 - 18 sections - each 2 1/4" X 2 1/4" - Available in black, red, blue or gray. Please specify color. FT 18a - 18 sections - each 7 1/4" X 2 1/2" - for coin cards, earring cards, and matchbooks, Available in black, red, blue or gray. Pleae specify color. 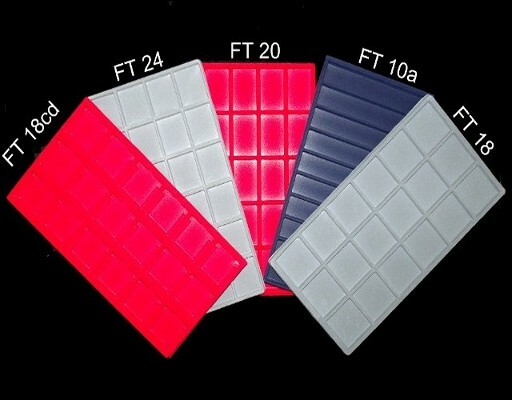 FT 20 - 20 sections - each 2 1/2" X 5/8" - Available in black, red, blue or gray. Please specify color. 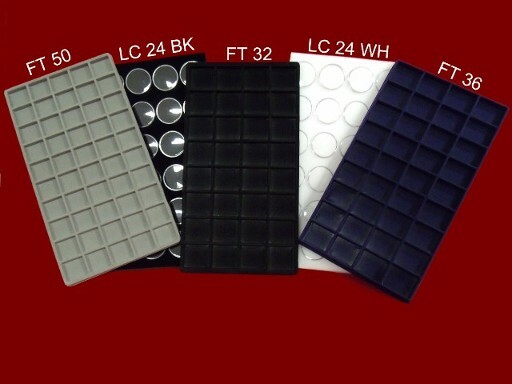 FT 24 - 24 sections - each 2" X 1 1/2" - Available in black, red, blue or gray. Please specify color. FT 32 - 32 sections - each 1 5/8" X 1 5/8" - Available in black, red, blue or gray. Please specify. FT 36 - 36 sections - each 1 5/8" X 1 3/8" - Available in black, red, blue or gray. Please specify. 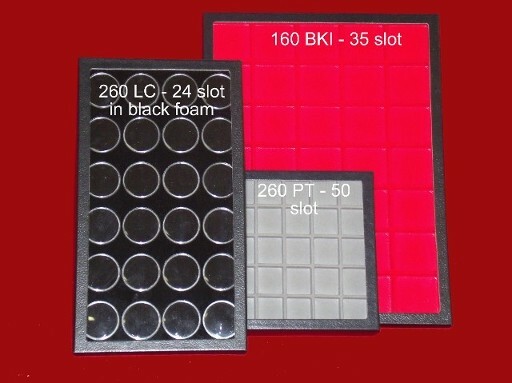 FT 50 - 50 sections - each 1 1/4" X 1 1/4" - Available in black, red, blue or gray. Please specify. Ring Pads - 72 slots - 14 1/4" X 7 3/4" - Available in black, red, blue or gray. Please specify. Riker-Type Chipboard Insert System: Purchase your 160 E, 260 E or 270 E, empty chipboards, add an assortment of inserts - purchased in quanities of 12 (must be at least 3 of each style and color) - and discover the unlimited possibilities of displaying. Contact us in Manchester, Ohio, to request more information on our affordable Riker-Type display cases.